With winter temperatures settling in across the country, here’s what you need to know about keeping your baby warm. 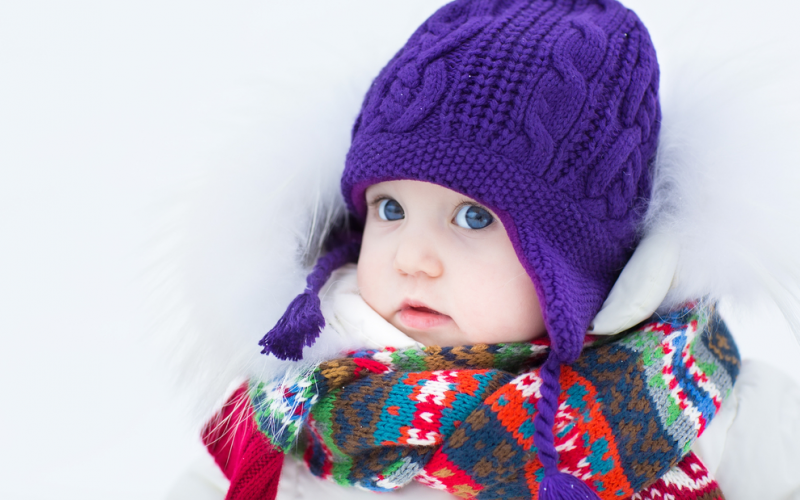 While you can put on an extra layer or two when you start to feel the cold, your baby may not be able to communicate as well about his or her heat loss needs. Also, babies don’t have a shivering reflex, so it can be extra hard to tell when they are dangerously cold. Babies, particularly newborns, have a difficult time maintaining their body temperatures because their subcutaneous fat tends to be leaner than an adult’s. In other words, babies are less “insulated” than us adults. If a baby’s body temperature decreases below 96.7° Fahrenheit or 36.5° Celsius, he or she cannot produce enough heat to maintain a body temperature, a condition known as hypothermia. In extreme cold, exposed skin is also at risk of frostbite. When dressing your baby to go outside, the American Academy of Pediatrics recommends dressing your child in one more layer of clothing than you would traditionally wear yourself. Thin, breathable layers are best. This includes putting mittens, a hat, and boots on your child if he or she does not have on an infant onesie with feet coverings. When indoors, you may be tempted to put extra blankets or pillows on a baby. However, these materials can increase a baby’s risk for experiencing Sudden Infant Death Syndrome (SIDS). Also, a blanket can easily cover a baby’s face while sleeping, affecting his or her breathing or causing suffocation. Instead, choose one-piece sleeper clothing, and keep the room at a comfortable temperature. You can also purchase a wearable blanket for your baby to keep them warm. Pay careful attention to your baby to ensure heat loss has not set in. Two places to feel are your child’s hands and stomach. If the hands are cold, but not the stomach, your child is likely cold but not hypothermic. However, if your child’s hands and stomach are cold, your child may be experiencing hypothermia. A child’s abdomen is a good indicator of internal temperature. If you feel your baby may be experiencing hypothermia, call 911 immediately. Hypothermia is a medical emergency and can quickly turn deadly. While you are waiting for medical help, wrap your baby in warm blankets and/or clothing to warm body temperature. Cold temperatures can cause life-threatening hypothermia in babies. Babies do not have as much fat or a shivering reflex, making it difficult to tell if they are experiencing heat stress. At night, your baby can wear a warm onesie or a wearable blanket; blankets should not be used in a baby’s crib. Signs your baby is too cold include an unwillingness to eat, red cheeks, refraining from crying, difficult to awaken, and swelling in the feet and hands. American Academy of Pediatrics. Winter Safety Tips. Hanretty, Kevin P. Obstetrics Illustrated. 7th Edition. 2009. University of Minnesota Amplatz Children’s Hospital. Keeping Your Newborn Warm. And please keep in mind that heavy winter coats are not meant to be worn while in a carseat in the car!